For all the details, look for this special insert in today’s issue of the Lassen County Times. 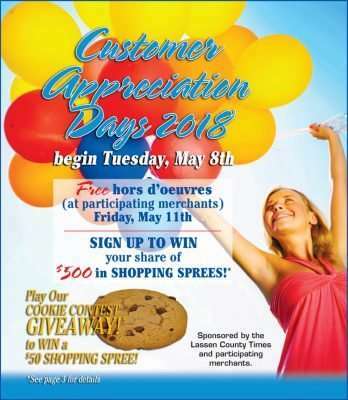 Customer Appreciation Days, sponsored by the Lassen County Times and other local participating merchants, begins today, Tuesday, May 8 and continues through Saturday, May 12. See the special supplement in today’s issue of the Lassen County Times and tomorrow’s editions of Chester Progressive and the Westwood PinePress. Participating merchants offer free hors d’oeuvres Friday, May 11. Community members may enter to win their share of a $500 shopping spree (two $100 shopping sprees and four $50 shopping sprees) at participating merchants in addition to prizes offered by individual sponsors including: A spa suite at Diamond Mountain Casino and $70 in casino gift certificates from Susanville Ford; a Mother’s Day basket by Milwood Florist and Treat’s Pet Supply; a $100 Ace gift card by Billington Ace Hardware; special drawings on May 8 at the Pet Station; and a four-foot-plus giraffe by Margie’s Book Nook. And don’t forget to play the Cookie Contest Giveaway to win one of two $50 shopping sprees — open to the first 15 customers Tuesday, May 8. The Pet Station will offer drawings for more prizes Tuesday, May 8. It’s the small businesses that keep the community going strong. Do your part to help the local economy thrive by visiting the Customer Appreciation sponsors and enjoy complimentary appetizers Friday, May 11 while supplies last. Participating merchants in Customer Appreciation Days include: The Pet Station, Susanville Ford, Sears Hometown Store, The Elegant Iris and Men’s Den. Zaengles Carpet One Floor and Home, Lassen Community College, Lassen Municipal Utility District, Les Schwab Tire Center, Susanville Supermarket, The Lassen County Times, Milwood Florist and Treats Pet Supply, Billington Ace Hardware, Diamond Mountain Casino and Hotel and Margie’s Book Nook. Increase your chances of winning by entering the drawings at every participating merchant.